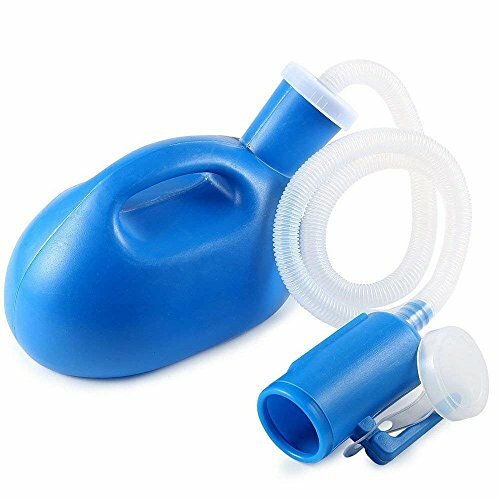 Male Urine funnel Diameter:5.5 CM/2.17"
Femal Urine funnel:12.5cm X 7cm X 7cm/4.9" X2.7" X 2.7"
The unique design of this urinal bottle makes it completely spill proof and leak proof. With handle,Can even be left in the bed, making it instantly available to the user. Easy to empty and clean using household disinfectants. It is perfect for bedside or vehicle use, The long tube allows the urinal to be used in multiple positions for bedridden patients. HIGH QUALITY:Made of high quality durable plastic material.It comes with an easy-grip handle for effortless use. BIG CAPACITY: 2000 ML for female. Good helper to take care patients. Convenient for adult storage 24-hour urine. REUSABLE: Can be reused after cleaning.It has graduations for measuring urine output. STRONG SEALING :Urine bucket sealing performance is good, is not leaking after use. FIT FOR: Bottle is perfect for anyone who's bedridden or has limited movement.Also comes in handy when traveling or anytime a restroom isn't available. If you have any questions about this product by STKYGOOD, contact us by completing and submitting the form below. If you are looking for a specif part number, please include it with your message.